Harold Henry Ewart was born on the 6th December 1890? in White Kangaroo River, Colebrook, Tasmania to John Peter & Johanna Ewart. His birth registration has never been found but his daughter Margaret said this is when he celebrated his birthday. During his teens Harry played football with both Runnymede and Buckland and was also a keen participator in local community sports days. Newspaper reports sourced from the NLA digitisation project show that he was involved with wood chopping and running and probably had a friendly rivalry with his mates, local boys Ern and Joe French as they too were mentioned in the press clippings. It was Joe French that Harry traveled to Claremont with in January of 1916 to enlist. Later in life Harry owned at least one and probably more deerhounds. In 1947 it is noted in the news that he was showing his dogs very successfully at local agricultural shows and state kennel championships. He also encouraged his children to exhibit animals at the local shows. In 1951 Harry attempted to find his sister Isobel. I wish I knew the outcome! 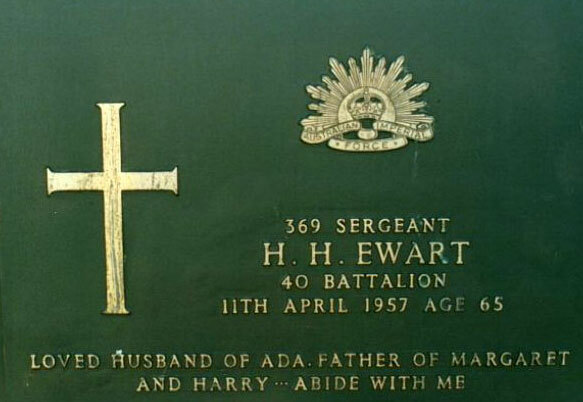 HH Ewart TPD Elizabeth St Hobart or Box 433 PO Launceston. Harold married Ada Bessie Cooper who at the time of her marriage was living at 177 Main Rd., Newtown, her occupation was listed as domestic duties and she was a spinster. She was called Adie, this was probably to distinguish between her and an aunt who was Ada Cooper also. Adie loved to read and write letters, collect stamps and post cards. She joined in the war effort by being a voluntary aide and assisted in army camps in Tasmania, this is probably where she met Harold upon his return from France. One of these camps was in the Lower Midlands, called Ellesmere. After Harold and Adie were married they moved house many times, mostly in and around Newtown and Glenorchy. Their first child, my mother, Margaret Isobel Ewart was born on 8th December 1924 at Queen Alexandria Hospital in Hobart. Their son Harry was born on 10th June in 1926. He was called "Boy" throughout his life. The Ewart family continued to move house quite frequently, Mum said she used to spend no more than about 4 months in any one school. I don't know what Harold did to earn a living, I know he was good at making things and we have a teddy bear and some wooden boxes that were made by him, but that dosen't keep a family of four. My grandmother Adie certainly would not have gone out to work. The family moved north in 1931 and settled at "Coombe Lodge" at Prossers Forest (outside of Launceston). A fairly impressive name for what was just a rough timber building placed in the middle of nowhere, no neighbours in sight and just rough tracks for access to and from Launceston. Harold operated a trucking business in and around Prossers Forest in 1935 (refer Examiner newspaper 5th August 1935). In this paper was published a photograph of Harold and his truck loaded with wood and covered in snow during a trip to Launceston. Margaret and Harry were standing by the running boards. This truck ( a 1926 Chev flat tray) is now in the posession of John Read. It was in a very sorry state but John is showing that with patience it can be restored. Harold and Adie moved to Evandale and then finally to Bakers Beach on the Rubicon River to a property called "Brentwood". Follow this link to read about Harold's involvement in World War I.
Harold died on 11th April 1957 at Devon House Hospital in Latrobe at the age of 66 years and is buried at St George's Church of England Cemetery at New Ground (near Latrobe) Tasmania. Adie moved to a house in Pitcairn St. Port Sorell where she spent the rest of her life apart from a short time living with us at Bakers Lane, Northdown. She was heavily involved with the Country Womens Association, being awarded life membership in the early 1970's. She spent her final years writing letters and notes and receiving visitors whenever she could. One of her favourite visitors was Dr Malcolm, Port Sorell and Latrobe districts family doctor. Whenever he was doing his rounds he would call in to see her and have a cup of tea. She died peacefully in hospital at Latrobe on 19th July 1975. Harold and Adie are both buried at St George's Church of England Cemetery, Newground.